MANILA, Philippines - The official results, list of passers, top examinees and other important announcements for March 2018 Civil Service Exam - Pen and Paper Test (CSE-PPT) both for professional and subprofessional levels are released by the Civil Service Commission (CSC) within sixty (60) days after the eligibility examinations. 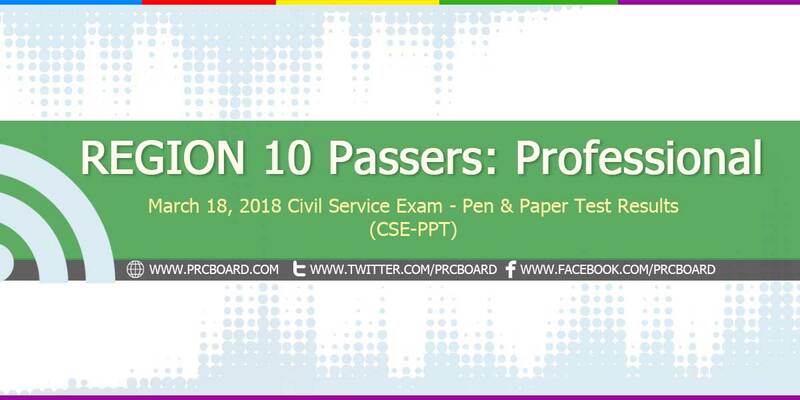 Below is the complete list of passers for March 2018 CSE-PPT Professional Level in Region 10 (Northern Mindanao). Sabi ng proctor namin during exam is after 61 days na daw ngayon ang result. KAILAN PO BA ANG RESULT NG ARMM? sana makapasa tayong lahat... kinakabahan ako sa result.. God help us.. Wish and pray i pass the civil service exam for me to to entry in the government agency as stenographer.Lord help me,with strong faith.God bless ! kailan ba talaga lalabas ang result? ang sabi ng prc 2 months after or 60 days after taking the exams! pwede po wag paasa! Updating... Stand by... Nakaka heart attack. 😂 sana pumasa lahat ng deserving. Godbless us All...think positive! aja..
Wala pa rin bang result?